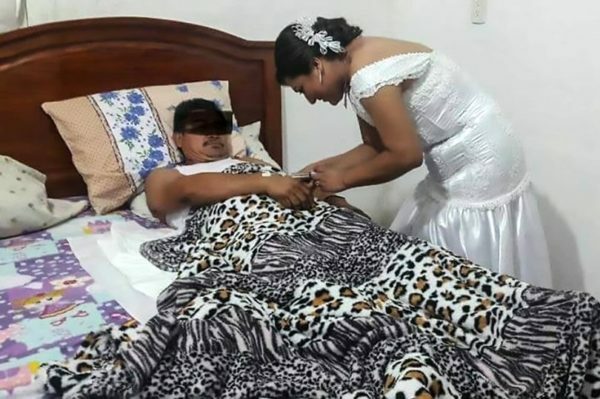 A dedicated Mexican nurse left her own wedding reception to tend to a patient, while still wearing her bridal gown. Yazmin Dominguez had just said her vows when she was alerted to an urgent medical problem with one of her patients. She made her excuses to her new husband and guests and rushed to the patient’s bedside. The man’s name and condition were not reported, and it was not clear why he suddenly needed Mrs Dominguez rather than any other nurse. Mrs Dominguez was pictured still in her wedding dress, giving her patient an injection. Unfazed by the medical emergency, she then returned to celebrate with friends and family on a ranch in the town of Paraiso in the southern Mexican state of Tabasco. The striking picture of her tending to her patient in her bridal gown spread wildly on social media.